The Grand Georgian, in the middle of the Village at Blue, is fashioned after a historic railway hotel, with over 200 suites ranging in size from studios with efficiency to full-size 3 bedroom apartments. The Grand Georgian Hotel is rustic elegance at its finest. Designed in the historic chateau style, with evocative towers, turrets and dormer windows, the Grand Georgian harkens back to the time of nation-building, exploration and discovery. As you enter the gracious lobby with its soaring six-metre ceiling, you feel a comfortable mix of the rustic and the refined that reflect the ambiance of a traditional grand resort. The décor of each resort home is warm, rich and welcoming, finished with exquisite natural stone and wood details. 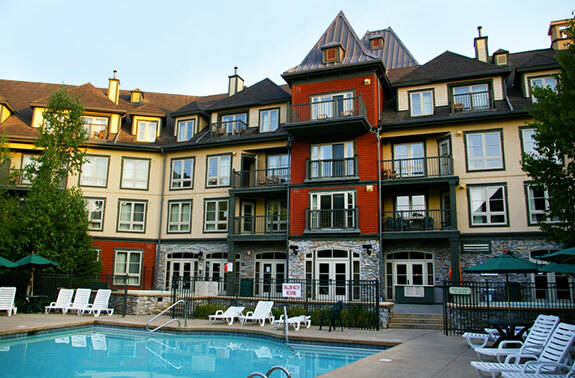 The Grand Georgian, as befits its name, is the cornerstone of the Village at Blue Mountain. Our hotel includes a drive-up lobby and full service front-desk manned 24/7. We offer exclusive access to secure underground parking, direct access to Starbucks, large Hearth Room off the lobby for guests and owners, games room, 2 outdoor hot tubs, seasonal outdoor pool, fitness room and sauna. Run Collingwood special room rates 10% off. A 10% discount will apply to the regular accommodation rate on the day of booking. Rates may vary from day to day. Accommodations are based on general availability. 30 days of arrival and final payment due on departure by cash, credit card, certified cheque or money order. CANCELLATION POLICY: Individuals have 10 days prior to their arrival to cancel or change the departure date (i.e. early departure) of their reservation with a $25.00 administration charge. Individuals who cancel or change their reservation within 10 days of arrival, will be given the opportunity to rebook their reservation for another date up to 12 months from the cancellation date. The deposit will be kept on file up to 12 months. If the individual has not rebooked and stayed within this time frame, the deposit on file will be forfeited. At check in, a $250.00 Blue Mountain Inn or $500.00 suite/condo damage deposit will be required for each unit by cash, credit card or certified cheque. All persons checking in will be required to provide valid photo identification. CHECK-IN TIME: Check-in is any time after 4pm. CHECK-OUT TIME: Check-out is 11am. We look forward to hosting Collingwood Half Marathon & 10K – 2018! Please be advised that record of your reservation may be shared with the organizer(s) of the group function. If you have any questions or comments, please do not hesitate to contact Blue Mountain – Information & Reservation Department at mail@bluemountain.ca or 877-445-0231.